At the same time that Clinton's State Department was lauding Colombia’s human rights record, her family was forging a financial relationship with Pacific Rubiales, the sprawling Canadian petroleum company at the center of Colombia’s labor strife. The Clintons were also developing commercial ties with the oil giant’s founder, Canadian financier Frank Giustra, who now occupies a seat on the board of the Clinton Foundation, the family’s global philanthropic empire. The details of these financial dealings remain murky, but this much is clear: After millions of dollars were pledged by the oil company to the Clinton Foundation -- supplemented by millions more from Giustra himself -- Secretary Clinton abruptly changed her position on the controversial U.S.- Colombia trade pact. Having opposed the deal as a bad one for labor rights back when she was a presidential candidate in 2008, she now promoted it, calling it “strongly in the interests of both Colombia and the United States.” The change of heart by Clinton and other Democratic leaders enabled congressional passage of a Colombia trade deal that experts say delivered big benefits to foreign investors like Giustra. So, what were the origins of this business relationship between the Clintons and Giustra? Giustra and Bill Clinton reportedly first met in 2005, at a fundraiser for tsunami victims held at Giustra’s home in Canada. They quickly became jet-setting friends. That year, as Giustra was on his way to becoming one of the Clinton Foundation’s largest individual donors, an aide to Bill Clinton arranged an introduction between Giustra and the then-president of Colombia, Alvaro Uribe, the Wall Street Journal reported. After the meeting, Uribe moved to begin privatizing his country’s state-owned oil company, Ecopetrol. Pacific Rubiales soon expanded its operations in Colombia in partnership with Ecopetrol, which was still being overseen by Uribe. 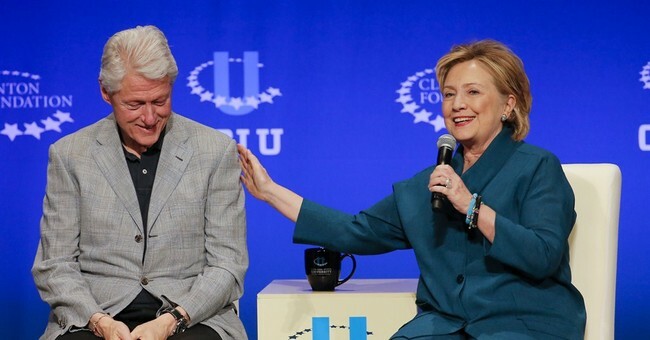 Giustra’s connections to Pacific Rubiales proved fruitful for the Clintons when in 2007 the oil giant became one of the first donors to a venture between Giustra and Bill Clinton. In a Pacific Rubiales news release quoting Giustra, the company announced that it was joining with its financial backers to give $4.4 million to the Clinton Giustra Enterprise Partnership (CGEP). Yet, after the 2008 election, both candidates had changed their position on the deal. The publication noted that Clinton does not go into specifics on what caused her to change her mind on the free trade agreement, but noted in her book–Hard Choices–that “violence was down dramatically” when she visited the country in June of 2010. She later met up with Bill, who was also in Colombia at the time on Foundation business. Union activists in Colombia say that even though they were disappointed by the passage of the trade agreement, they hoped Clinton’s State Department would hold Colombia to the promises it made in the Labor Action Plan and consequently end alleged anti-union hostility at Pacific Rubiales. [Richard] Trumka’s [AFL-CIO president] letter to the Obama administration (about reports of union-sympathizing Pacific Rubiales workers facing violence) specifically asked the administration to take action under the Labor Action Plan. That call was echoed by congressional lawmakers in a 2012 letter to the Colombian minister of labor -- copied to Clinton -- detailing how a strike at Pacific Rubiales was broken with the help of the Colombian military and how Pacific Rubiales engaged in mass firings of workers sympathetic to the labor organizing. But an IBTimes review of public State Department documents shows that as the Giustra-Clinton foundation relationship deepened, Hillary Clinton and the State Department never criticized or took action against the Colombian government for alleged violations of labor rights at Pacific Rubiales. “The Colombian government continued to make progress on improving respect for human rights, both within the Armed Forces and in Colombia at large,” the State Department declared in 2012, despite the allegations of collusion between the Colombian military and Pacific Rubiales to intimidate workers. By that time, Pacific Rubiales and its international financial partners had committed $4.4 million to the Clinton Foundation’s initiative with Giustra, and Giustra had pledged to donate more than $100 million to the joint venture. This is one of the reasons why people are wondering about the donations made to the Clinton Foundation. The donation the foundation received from the Algerian government has already been cited as an ethics violation. Clinton promised to disclose all of the donors giving to the foundation in an effort to be more transparent. The foundation stopped disclosing their donors in 2010. The agreement between the Clinton and the Obama administration regarding increased donations to the Clinton Health Access Initiative, which constitutes the bulk of the foundation’s expenditures, being subject to a State Department review were not honored. While President Clinton made assurances to the Obama administration that most foreign government donations would be curtailed, it did not include foreign individuals. Some of these people had ties to their own governments. While these dealings don’t suggest anything inherently nefarious, it does rehash the question that prompted Clinton to make the disclosure pledge in 2008: Are the Clintons being influenced by foreign donors? Moreover, will this development undercut her support of union rights? It seems challengers that are more left-leaning than Ms. Clinton might have their signature issue to run against her: workers rights. Clinton resigned from the Clinton Foundation last Sunday. Correction: The original post had mentioned a donation from a Chinese conglomerate with ties to the National People's Congress being made when Mrs. Clinton was Secretary of State. It was actually given right after she stepped down from her cabinet position in 2013. The post has been updated to reflect the changes, and the mentioning of the donation has been removed to avoid confusion. We apologize for the error.